The learned prince of Grenada, heir to the Spanish throne, imprisoned by order of the Crown for fear he would aspire to the throne, was kept in solitary confinement in the old prison at the Palace of Skulls, Madrid. After thirty-three years in this living tomb, death came to his release, and the following remarkable researchers, taken from the Bible, and marked with an old nail on the rough walls of his cell, told how the brain sought employment through the weary years. The 35th verse, 11th chapter of John, is the shortest. The 9th verse of the 8th chapter of Esther is the longest. The 8th verse of the 97th Psalm is the middle verse of the Bible. Each verse in Psalm 136 ends alike. The 37th chapter of Isaiah and 19th chapter of 2d Kings are alike. The word “girl” occurs but once in the Bible, and that in Joel, 3d chapter and 3d verse. The word “Lord” is found 1853 times, the word “Jehovah” 6855 times, the word “reverend” but once, and that in Psalms 111th chapter and 9th verse. The four most inspiring promises are in John, 14th chapter, 2d verse, 6th chapter and 37th verse; Matthew, 11th chapter and 28th verse, and in Psalms, 37th chapter and 4th verse. The finest chapter is in Acts, 26th. The average number of The Bible given away or sold in the USA is 168,000 daily. A companion of fools shall be destroyed. 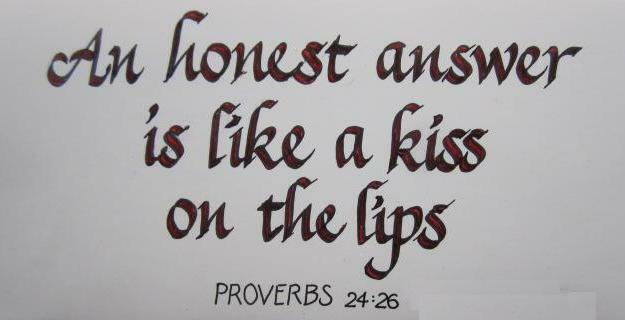 Meddle not with him that flattereth with his lips.—Proverbs 20:19. “Strength, and honour are her clothing; and she shall rejoice in time to come. She openeth her mouth with wisdom; and in her tongue is the law of kindness. She looketh well to the ways of her household; and eateth not the bread of idleness. Her children arise up, and call her blessed; her husband also, and he praiseth her.”—Proverbs 31: 25-28. This story can not be found in the Bible. But this was allegedly what truly happened!!! The deal that went on. God created the first man, Adam. God wanted that Adam lived comfortably in peace and harmony and not feel alone. Despite Adam living in an ideal world, where there were animals roaming the majestic landscape of Eden where he will never starve, nor need to go shopping for clothes, worry about mortgage, electricity and gas bills, God saw Adam looking forlorn. God asked Adam, why the long face. God was so moved by what Adam said that He promptly told Adam that He would create a companion for him. Adam really liked the sound of this. He asked God what would it cost to have such a companion.